It is said that if you write romance, you care about characters; if you write mysteries, you care about ideas; and if you write fantasy, you care about setting. That’s oversimplification, of course. But as a fantasy writer, I know setting is essential for me and often determines the whole story. Maybe I just like geography and maps (though, I am a terrible navigator). In reality, we all need to care about setting because it grounds our stories in the real world. A friend once wrote a story set in Barrow, Alaska, yet her descriptions of the school were so generic, I could have picked up that school and plopped it on the beach in Florida and the story wouldn’t have changed. Where we are in a story matters. Over the years, I’ve found some tools that help me with settings that are not where I am. 1. Flickr photos. A search of Flickr will turn up photos in almost any locale, any type setting. You're not publishing these, just using them for research, so don't worry about copyright. (Of course, worry about it if you plan to post or publish the photos anywhere! 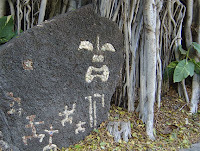 )This photo is from Hawaii: Kona, Big Island. 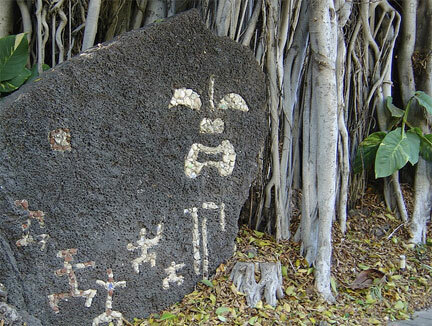 A decorative petroglyph amid the banyan roots in Kona, Hawaii. What a great detail to include in a story about Hawaii. 2. Google Earth. Our Indian friend once showed us on Google Maps his hometown in the foothills of the Himalayas. The steep terrain made the software fun to play with as we changed perspectives and moved around his village. 3. National Geographic Maps site, especially the Interactive Maps. This colorful mapping system lets you overlay all sorts of data. It’s good for a general reminder of terrain, temperatures, population, etc. For example, if you zoom in on Hawaii, you can see where the densest populations lies and decide if you want your story set in the middle of a low-population island or in the middle of Honolulu. 4. Sensory Details Worksheet. What you see, hear, smell, touch and taste can bring a story to life. Many people stick with visual details, because they are visual learners. Try to push yourself to include more details by creating a simple worksheet for yourself. Down the side of a page, write the five senses: See, Hear, Taste, Touch, Smell. Now close your eyes and put yourself in the situation of your story. Force yourself to try to write at least three details for each sense, being as specific as possible. Not just that you see a dog, but you see a German Shepherd with a red collar. When you write, use this as a reference to choose the best details, or to inspire new details. It will make your writing come alive. Here’s more on writing with rich sensory details. 5. Weather Photos. Always think about the weather that is happening around your characters, a most under-utilized story element. Weather can be stormy when character’s relationships are story, or it can counter-point the stormy relationship with calm, idyllic weather. Flickr and other photo sharing sites are great for finding images of weather that you can describe. 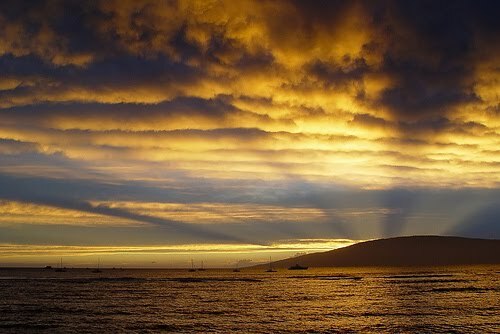 Describe the Hawaii weather in this photo. Excellent suggestions! I'm currently gathering images for the setting in my YA fantasy. So much of the tension comes from an attempted escape, that I have to have the setting firmly anchored before I can write these passages. I LOVE this post and thank you so much for the information and links. Brillian. I'd never really thought about the photograph idea to nail down a setting. Thanks for the great advice! I wouldn't mind sitting next to that petroglyph; it's pretty cold here!